How many times have you observed the Feast of Tabernacles? Twenty, 10, five? How many times will you observe the Feast in the future? It's hard to say, isn't it? We don't really know whether it will be five or six times or 10 times or more — or less — do we? What if you only had one more Feast of Tabernacles in this life? What would you do differently than at past Feasts? This year can and should be different because, being physical, our time is running out. For example, we only have our children at home with us for about 18 to 20 years at best. Are we using those 20 or 10 or five Feasts with our families to build strong relationships and a deep love and enthusiasm for God's laws and festivals that they will keep forever and pass on to their children? 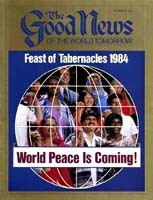 It's not too late to make strong, sound plans for the 1984 Feast of Tabernacles. Remember, those who fail to plan are planning to fail. When planning goals for the Feast — whether activities to build relationships between mates, parents and children, other family members or brethren, or to honor God in service or offerings — the first thing you should do is write down your goals. Get them on paper where you can see them. Next, ask yourself, realistically, Can I do all these things during this Feast? Is there something in your plans that needs to be scheduled next Feast or during this coming year or even next week? Don't frustrate yourself and your family with overly optimistic, unattainable goals. Get your family involved. Find out what your mate and your children want to accomplish during this Feast. Are there objections to a few of your plans? Don't dwell on the objections, but don't overlook them. Some of your plans may have to be revised. Remember, although you may have a list of goals for yourself, your planning should take your whole family into account. Now, when are you going to do it? Make yourself a Festival planning calendar. Keep it flexible, because schedules of services can change even during the Feast. List your goals according to priority. Let your family know that keeping God's Festival properly is what's most important, and that you are concerned about their desires and interests, too. Planning in this way allows your family to understand why everything they want to do isn't always possible, and why parents have to sometimes say no to children's wishes. Ask yourself what can be done before the Feast, on the way to the Feast or on the way back from the Feast. Some family activities might be scheduled then. Make sure your plans include scheduled Festival activities, such as the films and dances. This year, build family relationships, take a widow out, include some of your children's friends in a family activity. Really do it! Start your list of goals today. Your time is running out. Have you ever dined at a nice restaurant and been repulsed by the way another patron ate his food or by the ill-mannered way someone drank? Society today generally has lost many of the manners that were once considered only common decency. Too many parents do little to teach their children the proper attitude toward dining. But think a moment: It is easy to observe others' improper manners in dining, but what could others say of your example? More important, what does God think of it? We shall see shortly that God cannot help but take into account your eating and drinking at this Feast of Tabernacles. As Christians we are called to represent God on earth as Jesus Christ's ambassadors (II Corinthians 5:20). We are to be lights to this darkened world (Matthew 5:14-16). We are called to be as salt — a carefully prepared seasoning in people's lives in an otherwise foul-tasting society (verse 13). The often fiery trials of our lives as true Christians help salt us with divine character, which preserves us for eternity while preserving human life through the Great Tribulation (Mark 9:49-50, Proverbs 16:17, Matthew 24:21-22). You, then, as a humble, teachable light, and salted to God's good taste, are to represent God and Jesus Christ before this world and before your own brethren. And herein lies the shocker — something you may not have thought of before. You know God commands you to save your second tithe so you can go to where He has placed His name through His Church government and eat there before the Lord your God. And you are to rejoice before Him — both you and your household (Deuteronomy 14:22-26). The word eat in these verses means "to dine." Rejoice means "to cheer or brighten up." But the unusual point relates to the word before, which indicates turning your face to God so as to honor and be honored by Him. Like shewbread! The word shewbread means "bread of the presence." In the Old Testament it consisted of 12 unleavened loaves of bread (Josephus, Antiquities of the Jews, III, vi, 6) laid in two rows and displayed on a table in the holy place before God continually (The New Westminster Dictionary of the Bible, article "Shewbread," page 876). The shewbread was offered before God and changed every Sabbath. These loaves signified the constant communion between God and His people in those things that His bounty provided, and which His people enjoyed in His presence and used in His service. Do we grasp the awesome, symbolic meaning in all this? To go to the Feast lusting after all the food and drink we can heap on our persons, without understanding, will only bring frustrations and a curse on us. We are instead to represent holy, unleavened shew bread in rejoicing communion with God and our brethren, enjoying what God has provided to be used in His holy presence. That's quite different from abusing the blessings God gives us at the Feast, don't you agree? We need to go forward with this vision and dine and rejoice as God's shewbread, honoring Him and being honored by Him. This becomes part of our worship of the great God. No other festival more accurately represents God's future bounty on mankind, or His bounty on His Church today. This year, eat and rejoice before God with better understanding! Simply defined, etiquette is outgoing concern for those with whom we come in contact — good manners that put people at ease and smooth over problems. It is essential to practice etiquette at the Feast. Eating meals at restaurants is something to look forward to. When dining with others it is not appropriate to haggle over who will pay the bill. If others want to treat you, graciously allow them to. Allow enough time so you and your family can enjoy meals. You'll have more patience with the servers if you aren't pressed for time. If limited time is a problem between services on Holy Days, consider a picnic lunch in a nearby park, or have a group in to your hotel room. Avoid having to gulp down a meal before racing to services. We should practice good table manners whenever and wherever we eat. However, since many of us will be able to enjoy better-quality restaurants during the Feast than we are normally accustomed to, we may need to brush up on the finer points of table etiquette. Take a look through an etiquette book to refresh your memory on which utensil should be used when, and how to properly eat the foods you order. But etiquette is not merely knowing whether to use a fork or spoon for a fruit appetizer in a four-star restaurant; it applies to everything we do. Most of us will travel around Feast time, and for safety and peace of mind we need to carefully observe traffic laws and follow parking attendants' instructions. Observe rules set by the airlines for air travel. Being on time for flights and staying within baggage limits make the trip more pleasant. Let your light shine in your hotel or guest house. A clean and orderly room will not go unnoticed, just as an unkempt one will not. Children can stretch your welcome pretty thin if they aren't first instructed on how to act, and then supervised. Well-behaved children will be appreciated. It's easy to expect everything to go perfectly at the Feast. We sometimes forget that salesclerks, busboys and the hotel staff are people, too, and that they may have had a hard day. They will appreciate being treated with respect and given a smile. Acknowledge good service with a verbal compliment and tip if appropriate (see box). Be patient with mistakes and misunderstandings. You will probably want to spend most of the time at the Feast with your family. However, there are places where young children should not be taken, and would not enjoy being taken. Find a baby-sitter or don't attend the occasion if bringing your children will inconvenience them or other guests. Misunderstandings can be avoided if, when invited to dinner, you ask whether your children are also invited. When meeting people, introduce yourself clearly, and listen for the other person's name. One of the nicest compliments you can pay someone is to remember his or her name after your first meeting. When introducing people, it is generally accepted to first introduce the younger to the elder, and to introduce a man to a woman to show respect. When going to an international site, we have a responsibility to acquaint ourselves, if only briefly, with the culture of that country. A little knowledge of eating customs, the standard of living and the temperament typical of the country will help us better understand differences we find in the people and life-style. Be prepared to find things different than at home; this is what makes a foreign country appealing. It can help to talk to someone from that country, or someone who has been there and enjoyed it, before you visit. However, beware of preconceived ideas of what the people will be like. It never hurts to know a few words in the languages you will encounter. "Hello," "please" and "thank you" can take you a long way toward showing yourself friendly. Like it or not, tipping is an international custom that should be observed. Let's face it, giving money to an unenthusiastic airline porter after a hurried rush through the airport doesn't come naturally! Tipping shouldn't become a judgment, however, but an act of appreciation for help rendered. Find out about the tipping standards at the site you plan to attend. Be aware of whom and whom not to tip. This is especially important when traveling internationally, because of the varying economies and customs. In America, 15 percent of the total cost is the standard tip for the average meal out. If the evening turns out to be, without question, exceptional, you may want to give a full 20 percent. On the other hand, what if the meal arrives at your table late, and not only late but stone cold? Does this mean your waiter or waitress deserves no tip at all? No. In all but the most extreme cases, the standard, average tip should be left. How can you know it was the server's fault? Check this list for situations where you mayor may not be expected to tip. It is based on U.S. standards and may be adjusted accordingly. One dollar to an airline porter for two or three bags. Fifteen percent is standard for taxi service. If the driver is extraordinarily helpful, 20 percent. Fifty cents a bag to a porter. Fifteen percent to the dining-car waiter. One dollar a person to the sleeping-car attendant. Give one dollar to the doorman for removing bags from a car and an additional 50 cents if he calls a cab. The bellman receives one dollar a bag for taking care of luggage. If you are in valet parking, each time your car is brought up, one dollar. Figure 15 percent of the bill for room service. Don't forget the maid; before checkout, tip one dollar a room a day. If your party orders drinks before you are seated, tip the bartender 10 to 15 percent. Tip the captain five percent. Tip the wine steward two to five dollars. If you would like to tip the maitre d', that's fine, but don't feel that you have to. Standard tip for coat check is one dollar for each coat and 50 cents a coat for more than one. If there is already a charge, add on a quarter tip. During the year, we can think of various reasons that keep us from inviting people home to share some food with us. Of course there's always the old, "I can't afford it." What will be our excuse when we're at the Feast? Can the "I can't afford it" ploy still be valid at the Feast, when we can show hospitality in comparatively inexpensive ways, such as having some wine-and-cheese get-togethers? "Wine and cheese?" you ask. But that wouldn't be "adequate" — after all, it is the Feast, and the minimum you feel you should offer anybody invited to your temporary "booth" is at least one T -bone steak (which "you can't afford," of course). Hospitality rarely needs to be something enacted on a grand scale. If you think back on your own experiences, you'll no doubt recall that some of the finest times spent with old friends or making new ones revolved around some campfire soup, backyard barbecues or an ice cream on the way home from school. It's the action of sharing some food with somebody that is the basis of true hospitality, not the extent or complexity of the food involved. So, given the comparative economy (compared to a T-bone, that is!) of wine and cheese and the minimal preparation required, these two adequately fill the bill. Serve different types of cheese from different countries — it will help your guests' palates last longer as well as broaden everyone's experience. Separate the cheeses into groups of different strengths — the strong Belgian Limburger, the milder English Cheddar or Cheshire and the mild Dutch Edam or Gouda would be examples of the categories and nationalities you could choose. Serve cheese at room temperature for the best results. The cheese might dry out if it is all cut up into slices. Have a few slices cut, though, so everybody will not be worrying how big a slice to hack off. Have different knives for the different strengths of cheeses — the strong flavors could carryover to the milder ones if bits of your Limburger stick on your one knife and get mixed in with the Edam. Make sure that the cheeses will be ready to eat when served. Some dry out or "go off" quicker than others. Ask about this and other points when you buy cheeses. Don't serve crackers or bread that will overwhelm or conflict with the flavors of the cheeses — keep them plain and basic. White wine is best with the mild cheeses, red with the stronger ones. Beer also can be served with cheeses like Limburger. For people who would not be drinking alcohol, carbonated, sparkling or mineral water or apple juice would be suitable. Why not have a potluck wine-and-cheese get-together? Have each guest bring along a taste discovery of his or her own to share, and then the financial burden is lessened for the host — you! These are some ways to prepare and enjoy a wine-and-cheese "event." Now it's up to you. Make it a project to have more occasions of hospitality at the Feast this year. With the success of a wine-and-cheese open house at the Feast, we can be primed to play host to similar times back home throughout the year. The most important part of the Feast of Tabernacles is the spiritual food provided by God's ministers each of the eight days. The social life, side trips, fine dining and recreation are all short-term benefits. But spiritual food provides inspiration and strength for years to come — even for all eternity. To get the most out of each message, you need to be both physically and mentally prepared. I am writing this as a minister who has been preaching at the Feast for 25 years. Any of God's ministers will tell you a Feast sermon is something special. The sermons at the Feast are the most powerful and inspirational most of the ministers give. The larger crowds and the special occasion provide strong motivation. Of course, each minister knows that one sermon is not going to change the course of human events. But maybe just one life will be helped or changed. All that effort will be well worth it. But in order for any sermon to be effective it must be heard. If words fall on deaf ears, empty minds or simply waft into the air, nothing is gained. And that's where you come in. I don't know how often I have heard the words: "That was a wonderful sermon M r. So-and-So gave. I wish my husband (wife, friend) had been here today. But one of the children was sick and he (she) had to stay home." It has even been humorous sometimes — a minister planned a sermon on a given topic only to find the ones he most meant it for were not present the day he gave it. So make a concentrated effort to attend every single service. You might miss the one sermon that would have been just what you needed. Next, give your undivided attention to the sermon. Being a good listener is important. You've no doubt heard powerful sermons when the whole audience seemed at one with the minister — when he paused for a few seconds, you could hear a pin drop. But there are other times when the din from babies crying, children shuffling and people moving about make it seem impossible to concentrate on the sermon. The approximately two hours set aside for services and preaching should be completely devoted to listening. Let me speak frankly. I have been puzzled for years why so many people have to take themselves or their children to the rest room during services — in many cases three or four times in one service. Most families ought to be able to take care of those needs in the motels before departure, or at the auditorium before services begin. Obviously, those with small babies or those who may have health problems have a need to be in the rest rooms or mothers' rooms. But if you teach your children and discipline yourselves, it will help you and the dozens seated around you not to be disturbed by the constant treks out. Another point! Over the years many members have found it helpful to look up scriptures and read along with the minister as he quotes God's Word. Most members also take notes on the sermon to have a reference for later study. There is no doubt that taking notes and looking up scriptures helps one remember better. But don't let this practice become a burden. Take just enough notes to help you review later, or to reinforce a main point being made. Your responsive look is much more pleasant to view while preaching than the top of your head, which is all the minister can see if your head is buried in too much reading or excessive note-taking. As you make final preparations for the Feast this year, give a little thought to the most important reason you are going — to be inspired by God's ministers and learn more of His plan. Listen intently and respond to every sermon. You'll be glad you did. During the Festival season, families spend a lot of time at such activities as traveling in the car and sitting in the hotel room waiting to go somewhere for dinner. Is this time wasted? Even though it's time spent together, it could probably be used in a better, more efficient way. The alphabet object game is popular among children especially. The object of the game is to find objects outside the car that begin with each of the letters of the alphabet. For instance, Johnny might say, "I see an automobile for a." After he has chosen an automobile, no other member of the family can use the same object. Then he might say, "I see a building for b." The first person to get to the end of the alphabet wins. You might want to delete letters such as q, x or z. Another game using the alphabet is the alphabet memory game. This can be challenging for Mom and Dad and older children. The person starting the game says, "I'm taking an apple (for a) to the Feast." Then the second person must repeat what the first person said and add something for the letter b, such as, "I'm taking an apple and a banana to the Feast." Then the third person must repeat what the first two said and add something for the letter c. As you can see, by the time you get to the last letter, it is quite a long list of things to memorize. A variation is to use only biblical words or names for the letters. For example, "At the Feast I'll see Adam, Barak and Caiaphas." This helps one become more familiar with Bible terms. There are many more games that you and your family might like to try during spare time at the Feast. Memory games, auto bingo, 20 questions and Bible quizzes are always popular. Check out a book at the library and learn some new games. Make the Feast a family Feast and make the most of family time! Churches obtain financial support from many different sources, among them government taxes, pledges, weekly collections and public solicitations. God's true Church, however, does not use these means, but looks rather to God for its needs. But how does God supply the needs of the Church? He instructs, commands, inspires and influences humans to provide what His Church requires through tithes and offerings. Most of these people are Church members. Members supply about 80 percent of the Church's financial support. The remainder comes from people who have voluntarily become co-workers and from others who, without solicitation, send in occasional donations. In general, funds are contributed in two ways: One way is contributions given through the mail, through bank transfers or to local ministers, depending on the country and local circumstances. The second way is through Holy Day offerings. "Three times a year all your men must appear before the Lord your God at the place he will choose: at the Feast of Unleavened Bread, the Feast of Weeks and the Feast of Tabernacles. No man should appear before the Lord empty-handed: Each of you must bring a gift in proportion to the way the Lord your God has blessed you" (Deuteronomy 16:16-17, New International Version). A similar command is given in verse 10 concerning the Feast of Weeks or Pentecost. This instruction from God relates to "three times a year." There are seven feasts in the year. Did God intend that four of them have no such command? No. The command refers to the three seasons or periods of the year when these special gifts are to be presented. Two of God's feasts, the Passover and the Days of Unleavened Bread, are grouped together in the spring. God's third festival, Pentecost, occurs in early summer. The final four festivals — the Feast of Trumpets, the Day of Atonement, the Feast of Tabernacles and the Last Great Day — are observed in the fall. So the term three times in Deuteronomy 16:16-17 refers to these three seasons and includes all the feasts. As a matter of convenience for the giver and for those who receive and process the gifts, God's Church has traditionally collected these offerings on the seven high days, or Holy Days. The next point we should note is that this command is directed to men. Notice similar passages found in Exodus 23:14-17 and Exodus 34:22-23. Sometimes, because of pregnancy or small children, women might not be able to travel the distance required to attend some of the festivals. Normally, of course, the whole family is expected to attend, as well as the widows and fatherless (Deuteronomy 16:14). There is no prohibition against women also presenting a gift, even if widowed, as we could conclude from a similar situation in Mark 12:42. The place that these gifts are to be presented is the place that God chooses. It is the responsibility of the Church leadership, guided by God, to determine the Festival sites where the Church gathers together. The last point in this passage relates to the size of the gift or offering. After God blesses us, He watches to see how much we believe He has blessed us, by observing the kind of appreciation we show in the size of our offering. We all must consider the physical and spiritual law that we reap what we sow (II Corinthians 9:6). Another important aspect about giving is the proper attitude of the giver (verse 7). It seems members of God's Church take a wide range of approaches in how they view Holy Day offerings. Apparently, a few have little concern and are ill-prepared for these scheduled gifts. Or, instead of really giving an extra offering, they give what would be part of their regular tithes and offerings. As a result, the regular tithes and offerings seem to be lower for months in which Holy Days fall. This should not be. Holy Day offerings should be above and beyond normal tithes and offerings. Some members really are concerned and prepare throughout the year for these offerings. Some even set aside an amount from each paycheck from which to provide Holy Day offerings. It has been obvious in recent years that God's people are taking this responsibility more seriously, as the per-person amounts have been increasing considerably, far above the increases in wages and income. "Let him who is taught the word share in all good things with him who teaches. Do not be deceived, God is not mocked; for whatever a man sows, that he will also reap. For he who sows to his flesh will of the flesh reap corruption, but he who sows to the Spirit will of the Spirit reap everlasting life. And let us not grow weary while doing good, for in due season we shall reap if we do not lose heart" (Galatians 6:6-9). All of us look forward to the Feast of Tabernacles with great anticipation for the many physical and spiritual blessings God allows us to enjoy. The Feast is a wonderful foretaste of the Kingdom of God. However, it's hard to enjoy those physical and spiritual blessings if we spend most of the Feast in a state of utter exhaustion or walking around feeling like the Goodyear blimp as we go from restaurant to restaurant. First, don't go to the Feast with the idea of "doing" Europe or the American West. Orient your sight-seeing toward quality, not quantity. This entails some planning on your part. Do a little research on your Feast site and surrounding area. Find out what you would really like to see and do, realistically, in the time you have. Second, while you're checking on the local points of interest, find out what kind of weather you can expect at your Feast site. Pack the kind of clothing that will be appropriate. And learn to travel light. We've all seen the weary traveler who looks more like a burdened- down pack mule than a carefree tourist. Third, don't forget to get some exercise during the Feast. A nice contemplative walk or jog is a good way to meditate on what you've learned in services. Do as much of your sight-seeing as possible on foot, and be sure to take some good walking shoes along. Fourth, watch your diet. It's nice to be able to sample the various exotic cuisines we may happen upon, but try to eat a good, wholesome diet. Be sure to drink plenty of good, clean water as well. Also, be careful where you eat and what you eat. Many a Feastgoer has been felled by some most-unfriendly local bug or virus. The Eternal wants us to rejoice before Him. In III John 2, the apostle John was inspired to write, "Beloved, I pray that you may prosper in all things and be in health." If we realistically plan our sightseeing, take appropriate clothing, get some exercise and eat a moderate, balanced diet — in other words, use common sense — we can all have a happier, healthier Feast this year. The highlight of the year? Most members of God's Church would certainly say that it is the Feast of Tabernacles. The Feast is an event for which they begin to plan many months in advance. And then, in eight short but marvelous days, it's all over for another year. It should not surprise anyone that the Feast comes to a close. We know it is just a temporary sampling of greater things to come. And yet, how often " post-Feast letdown" makes itself felt to one degree or another! A certain amount of sadness is understandable. We all wish we didn't have to scatter out into the world for another year. We long for God's Kingdom to be permanently established. But we shouldn't let letdown hinder our growth and effectiveness. Actually, whether or not letdown becomes a problem depends to a large extent on a person's attitude and conduct during the Feast itself. Those who tend to overemphasize the physical aspect or who look on the Feast mostly as a vacation are leaving themselves wide open for letdown. This can especially be a factor where children are involved. One suggestion for lessening the problem may be to not raise one's living standard during the Feast so out of proportion that there is a near culture shock when returning to the normal routine. After all, while we are to rejoice in abundance, the object of the Feast really isn't to squander second tithe by any means possible just to get rid of it, and all on ourselves. We also need to remember the needy and the surplus second-tithe fund. Another essential for relieving post-Feast letdown is to get enough rest during the Feast. We shouldn't allow the Feast to become a hectic, burn -the-candle-at -both-ends marathon that leaves us spiritually depleted, physically exhausted and in need of a rest. Ideally, the Feast of Tabernacles should be a restful time of spiritual and physical rejuvenation, leaving one eager to get back to the business at hand and to finish it so God's Kingdom can come. With care and effort on our part, we can keep it that way.